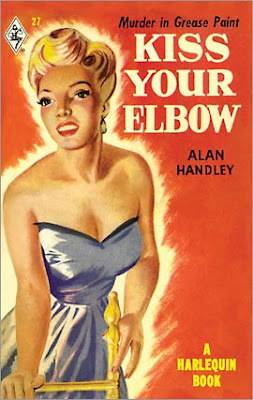 Those who know Harlequin Books only as a major publisher of romance novels will be startled to learn that it has a shady past: It once issued pulp-noir in the murky post-WWII era. 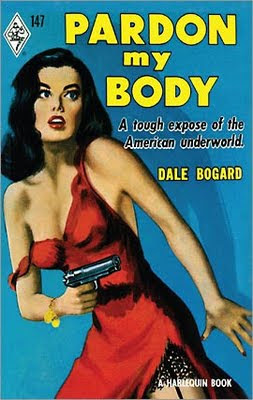 Last October they reissued six titles from their Top Secret vault as their Mini-Series Vintage Collection. Hats off. A hip art project gone bad. “But in some cases,” Zinberg continued, "once we started reading the text, we simply couldn’t see publishing the story, for a host of reasons….content, language, political correctness, etc. 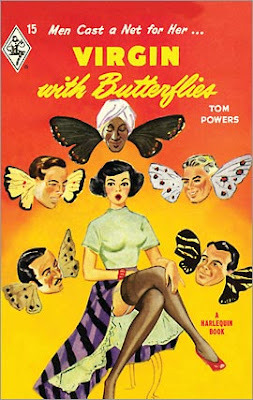 Several were eliminated, no matter how striking the cover!" A hip art project gone very bad. Hats back on, tight. In short, they put the text through a strainer, saved the sweet and tossed the pulp. 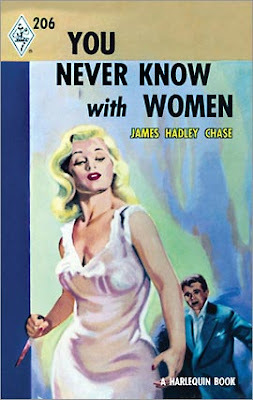 This is, after all, Harlequin Books. Gushing, Ms. Zinberg summed up the experience. “Everyone in-house has taken such interest and pride in this project, and we're delighted that the collection is now out in the marketplace. We hope they will also accomplish what the cover art exhibition attempted to do: "offer a unique insight into the profound changes that have occurred in women’s lives over the past six decades — from shifts in private desires to shifts in the politics of gender." 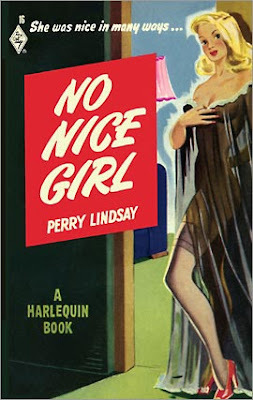 With “small adjustments” made to the historical and literary record in the service of Harlequin’s reputation in defense of its readers' tender 2009 sensibilities. You've come a long way, baby. Aren't you glad you have a big sister to hold your hand? It's tough out there in the world of hard-boiled dicks. Let's take this to it's logical conclusion. 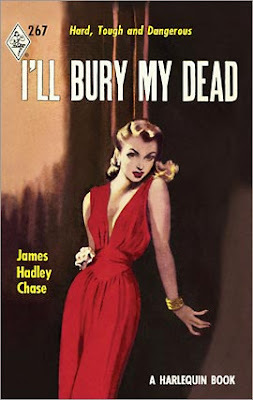 Jim Thompson, Charles Williford, James M. Cain, Mickey Spillane, Hammett, Chandler - these writers have been getting away with murder for years. Time to pasteurize these bums. So say ai, ai, ai the jury! Thanks to Brian Busby at The Dusty Bookcase for the lead.